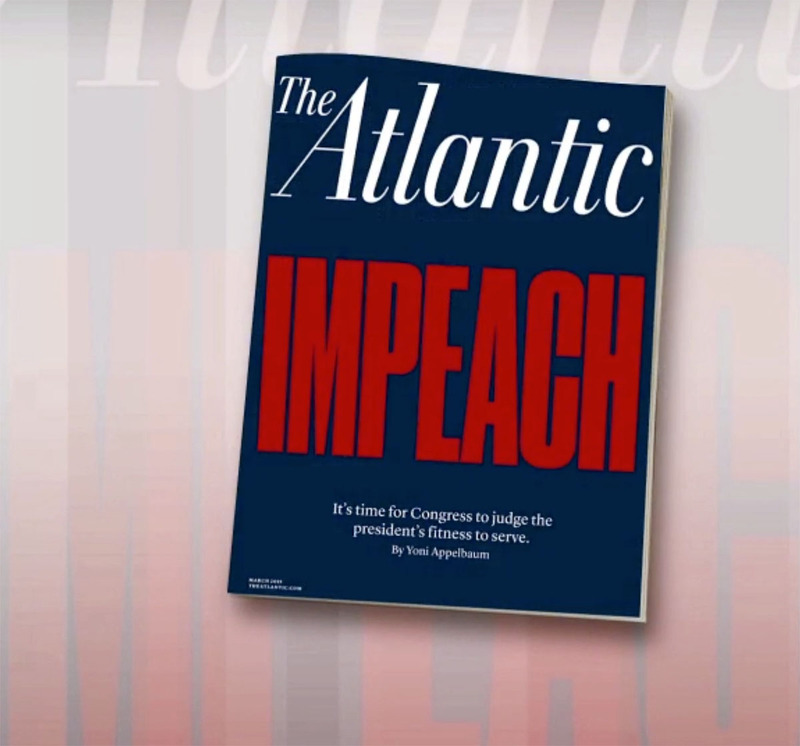 The March cover story of The Atlantic probably marks a turning point in the long process of bringing Donald Trump to justice. The Atlantic is a centrist publication that often speaks for Washington’s centrist think-tank establishment. This article makes it official: the centrist Washington establishment is done with Trump. They now understand what he has done. Here’s a link to the article, which is magisterial: Impeach Donald Trump. February 7 probably is the day when most Americans, who are very busy and distracted, will begin to pay attention. That’s the day Michael Cohen (Trump’s “fixer” and former attorney) starts his testimony to the House Oversight Committee. On February 8, Matthew Whitaker (Trump’s acting attorney general) will testify before the House Judiciary Committee. My view, based of course only on dot-connecting and following bread crumbs, is that Washington already knows what has to happen — that Trump must leave office. It took time to collect the evidence and to build the legal case. It appears that Robert Mueller is almost done with that. The next step, then, is to inform the American people and to prepare the American people for what is going to happen. That preparation process is now beginning. It seems highly likely that yesterday’s reports that Trump instructed Cohen to lie under oath to Congress about the Moscow Trump Tower project (that alone would be grounds for impeachment) is a part of the preparation process. What the American people are going to learn from Cohen’s testimony on February 7 is going to be shocking. As Yoni Appelbaum points out in the Atlantic article, once Trump’s crimes start being described in day after day of public testimony in Congress, Trump (and Fox News) will have no chance of controlling the narrative. Instead, the narrative will be about the FBI’s evidence and congressional testimony under oath. This was written by daltoni. Posted on Friday, January 18, 2019, at 8:18 am. Filed under Political issues. Bookmark the permalink. Follow comments here with the RSS feed. Trackbacks are closed, but you can post a comment. I’m astounded by those who see him as a rational person. His behavior on Twitter should give them some insight into his behavior in person and his thought process. I know they wouldn’t see an impeachment as a comeuppance but – given how far removed they are from reality – as an ambush. I’ve heard conservatives compare the need for a border wall to the need for Israel to maintain a border wall. That reveals a lot about them. They think Palestinians have no right to be in the West Bank, for starters. They think the US and Mexico are so dissimilar we should maintain a structure to protect us from terrorists. They might even consider the US a holy land and see Mexico as Sodom and Gomorrah. February 7 will be interesting. I’m sure his supporters will be emboldened with rage against the tyranny of Democrats and see a move against him as treason. Hopefully, there isn’t any violent fallout from what would surely be the best thing to happen for the country. It’s going to be rough. Die-hard Trump supporters will find it impossible to believe anything other than that it’s a coup. Even with the full story of Trump’s crimes and treason laid out for all to see, they won’t believe it. Trump doesn’t care how much damage he does to American institutions or the American psyche. I expect him to try to leave as much wreckage as possible. I’m hearing from people who say that some Trump die-hards are threatening “civil war.” Given that they are only 30 percent, that would be rather foolish.